Are the midterms going to hurt Republicans? A lot of incumbent Republicans, and of course all Democrats seem to think so, but I'm not convinced. I don't see a blue wave at this point. I may be guilty of confirmation bias but in my opinion everyone predicting a blue wave are guilty of the same confirmation bias they exhibited in 2016 regarding president Trump in the primaries and then again in the general election. Besides which, even though it's already April, an awful lot could happen between now and the midterms in November. There's more to it than that. I looked at Rasmussen's survey of whether the country is going in the right direction or wrong direction, going back to 2010 - that's an eight year window. This could be where you argue my confirmation bias comes in, but I'll address that in a moment. 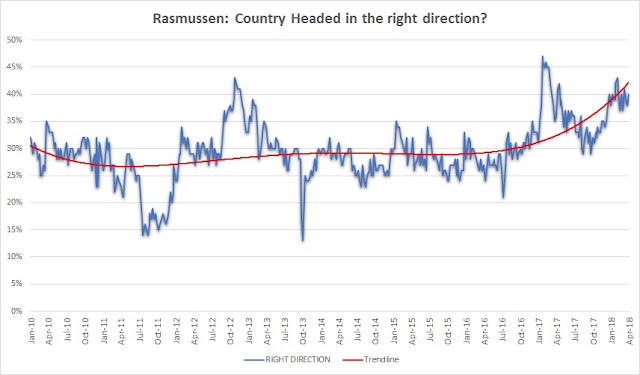 There is a definite change in Rasmussen's survey results as you can see in the chart I've created below, and it's particularly visible since November of 2017, when president Trump won the election. Detractors could accuse me of exhibiting confirmation bias by using Rasmussen, which is generally regarded as a conservative pollster. Except that they appear to have used the same methodology in the survey as far as I can see. And Rasmussen does not interview only Republicans. Any bias Rasmussen exhibits is inherent in the data and reflected across time. You can argue the scope of the bias by the relative weighting of Republicans, Democrats and Independents being surveyed. But if the numbers are relatively consistent (or consistent with other measures that Rasmussen employs to determine the ratio of those groups) then the bias is limited to the original error and consistent across time eight years' worth of time). Therefore the uptick is real because within his survey, consistent in methodology, there is indeed a Trump uptick. That said, the uptick could represent two different things; (1) people generally feeling things are getting better, to some varying degrees, across the political spectrum or (2) conservatives or Republicans becoming more positive, and Democrats becoming less positive but not enough to offset Republican (and perhaps Independents as well) growing enthusiasm. Either way that does not point to a blue wave. There could still be a blue wave, and indeed Republicans should ALWAYS operate under that assumption in order to prevent it. But so far the evidence put forth to validate the conjecture is not convincing. Whether many Republicans deserve re-election is another issue, but the uptick means many voters seem willing to at least overlook their recent 'transgressions', and or president Trump's.